Eola Hills Wine Cellars | Join us for every Sunday in August for a fully supported bike tour! Routes are between 45 and 70 miles, and start and finish at Eola Hills Wine Cellars. Lunch will be provided at one of many participating wineries. After the ride, enjoy a fantastic barbecue feast and a glass or two of Eola Hills wine. For more info, visit website or call Rich at 503-623-2405. August only. The Twisted Cork Wine Bar | Join us at The Twisted Cork Wine Bar in Grants Pass for a unique dinner paired with a special collection of Cilff Creek Wines including the new 2012 MRV and the limited release Sangiovese. Call The Twisted Cork for reservations: 541-295-3094. Time: 6 to 9 p.m.
J. Christopher Winery | Join the OSBC members, Andrew Rich, Patricia Green Cellars and J. Christopher for a dazzling array of Oregon’s finest white wines served (weather permitting) in an open air environment at the base of the Chehalem Mounains. Rumor has it Pinot Noir will be poured too! We will also have local artisans who will be showing their goods Oregon Truffle Oil and Briar Rose Creamery to name two. Time: 11 a.m. to 4 p.m. Fee: $20. The Oregon Olive Mill at Red Ridge Farms | The public is welcome to visit the property, stroll through the lush lavender fields, comprised of numerous different varieties and enjoy lavender-themed activities and treats. Guests can harvest their own lavender, create wreaths and enjoy lavender-inspired treats.The event coincides with the Oregon Lavender Festival and celebrates all things lavender. Fee: $45. Time: 10:30 a.m. to 12:30 p.m. For more information about the festival, visit www.oregonlavenderdestinations.com. Beulah Park | Yamhelas Community Resource Center (YCRC) presents the Yamhill Lavender Festival & Plein Air Art Show in historic Yamhill, Oregon. Admission: free. July 13: 10 a.m. to 8 p.m.; July 14: 10 a.m. to 5 p.m.
Sweet Earth Vineyards | The Loose Nuts Car Club featuring Pre-49 Street Rods! Fine wine and fun! Bring a picnic and enjoy the party pavilion. Fee: $5 (refundable). Time: noon to 5 p.m.
Jacob Williams | Join us to taste wine, barrel tasting and a sumptuous BBQ. You will love the wine and the scenery! 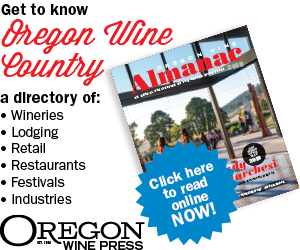 Time: 10 a.m. to 6 p.m.
North Willamette Vintners Association | Participating wineries including; A Blooming Hill Vineyard, Apolloni Vineyards, David Hill Vineyards & Winery, Elk Cove Vineyards, Helvetia Winery, Kramer Vineyards, Plum Hill Vineyards, Provincial Vineyards, Shafer Vineyards. The event, sponsored by the offers a fun day of complimentary wine tastings and special activities for owners and their pets at more than a dozen dog-friendly wineries. Guests and their furry friends will enjoy food, contests and special activities for $40, with 100% of proceeds benefiting the Oregon Humane Society. Fee: $40. Time: 11 a.m. to 4 p.m.
Hyland Estates for McMinnville Rotary | See news brief on page 6. Tickets: $125; $1250 (per table). DePonte Cellars | Please join us for our annual evening in the vineyard while enjoying a few of our favorite things: wine, music, food and BIG DOGS! Please do not bring your animals. Fee: $50. Time: 5:30 to 8:30 p.m.
Anne Amie Vineyards | Each year, we kick off the International Pinot Noir Celebration with our pre-IPNC event, Counter Culture: A Celebration of Urban Street Food and International Wines. With a beautiful setting about our estate vineyards, guests can enjoy sweeping views of the Pacific Coast Range while indulging in world-class “street food” cuisine from a selection of the best restaurants and food carts in Portland paired with fantastic wines from all over the world. Fee: $75. Time: 6 to 10 p.m.
Carlton Cellars Estate Vineyard | The beloved tradition of our estate vineyard lunches continues this summer with an exciting new development. Each 2013 lunch will feature the talents of a different guest chef, from some of the most respected restaurants in the region. Guest chef to be announced. Stay tuned. Time: noon to 3 p.m. Fee: $55; $45 (wine club members). Garland Nursery | Our beautiful gardens provide an amazing backdrop to wander through as you enjoy all the wonderful art and crafts from more than 25 local artisans and partake in great wine or enjoy sips of Vivacity Spirits. Wares include watercolors, fused glass, unique jewelry, sculptures, mosaics and much more. FREE and open to the public. Wine, food, art and crafts for purchase. Time: 10 a.m. to 4 p.m.
Lange Estate Winery | “Get the dirt here! With intoxicating enthusiasm, Dr. Scott Burns will explain how millions of years’ worth of geology in the form of volcanoes, tectonic shifts and massive flooding, created the unique soils of the Dundee Hills. Winemaker Jesse Lange will then present a guided tasting of our coveted 2010 Lange Estate, Freedom Hill & Yamhill Single Vineyard Pinot Noirs, paired with delicious appetizers. Fee: $40. Time: 11 a.m. to 1 p.m.